Director of Engineering – Dorner Mfg. Corp. Flexibility and sanitation are two key advantages plastic chain conveyor systems bring to food manufacturing applications. Made of injection-molded polyethylene or acetyl plastic, plastic chain belt conveyors involve linking together rows of modules by hinge rods to form a continuous belt chain. Plastic sprockets around the conveyor’s spindle positively drive the conveyor. These spindles provide excellent tracking by preventing belt slippage during operation especially in wet environments. By its very nature, plastic chain belting gives users great flexibility in designing their conveyor systems. Plastic chain belting can easily make turns and flex to go up inclines or down declines. It’s common for a conveyor system to snake around obstacles in a plant with tight turns; saving production space and reducing the number of product transfers which eliminates areas for product loss. Another example of its flexibility is seen in custom-built conveyor systems. Plastic chain belting can be made to virtually any width or length, giving customers the ability to order a conveyor system to fit their exact specifications. 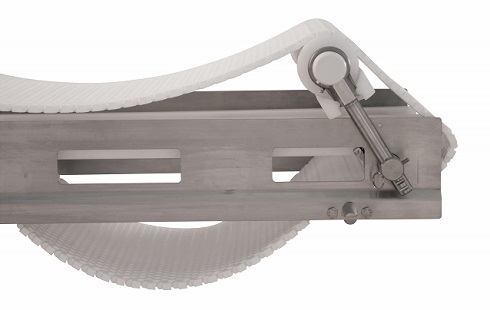 If a system calls for multiple conveyors, a smaller pitch plastic chain belt can be used to accommodate tight transfers of product from one conveyor to another. With these tight transfers users are able to reduce product loss at transfer. 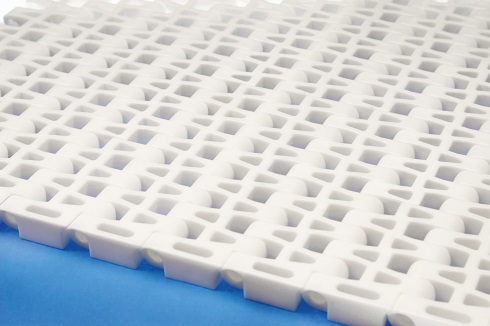 Many food applications call for an open-mesh plastic chain belt for enhanced sanitation or for cooling or air flow. As implied by its name, open mesh allows for water and cleaning agents to drain off the belt; drainage isn’t as good on a standard belt conveyor where water only wicks off the sides. Plastic chain belts are resistant to water and most cleaning agents, which gives the customer the ability to wash down the conveyor, in some cases many times a day, depending on the application. Its open mesh design allows for optimal drainage and minimal downtime. The plastic chain belts have easy-to-clean surfaces, and are extremely durable; offering great resistance to cuts. If parts of the plastic chain belt does get damaged, repairs can be quickly made by simply removing the hinge rod of the affected chain module and replacing it with a new section – the rest of the belt can remain in place on the conveyor. Common food applications where plastic chain conveyor systems offer the greatest advantages are meat, poultry, snack food and confections, ready-to-eat foods, bakery and seafood. 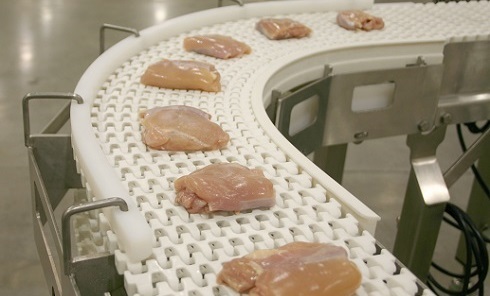 Customers using plastic chain conveyor systems find the added flexibility and increased sanitation are two critical elements that make them an ideal fit in the food manufacturing industry. These features, along with many others, give plastic chain conveyors more production time and a higher return on investment.